Everyone knows that I love a Fakeaway! If it tastes unhealthy but won’t affect my waistline (or better yet helps me to lose weight) you’ll find me cooking it. 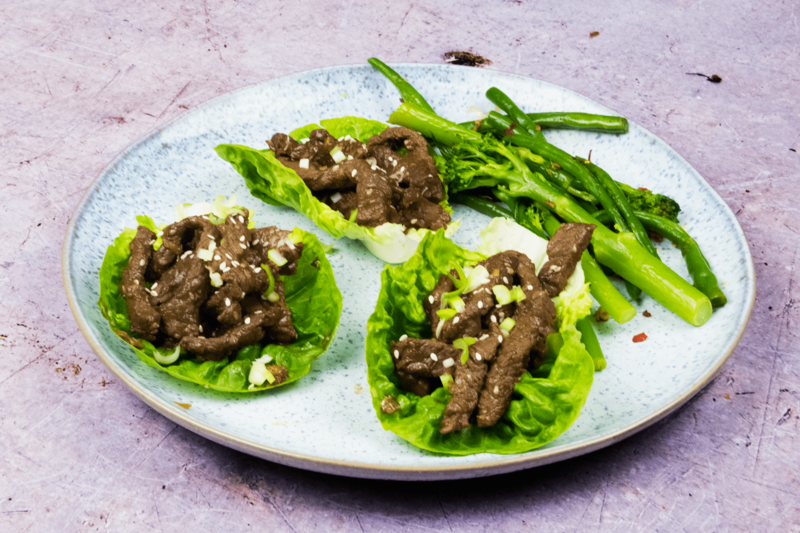 This week I wanted to cook up something with an Asian influence, so I’ve put together this recipe for Healthy Teriyaki Beef which couldn’t be any more simple. This recipe for Healthy Teriyaki Beef is not only simple but it’s also low syn on Slimming World, as well as being super balanced nutritionally. 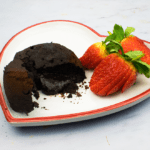 This recipe is the ultimate healthy Fakeaway! It’s full of flavour, with garlic, ginger, sesame, soy, spring onion and honey all working perfectly together to give you the classic Teriyaki flavour without making it super high in syns. 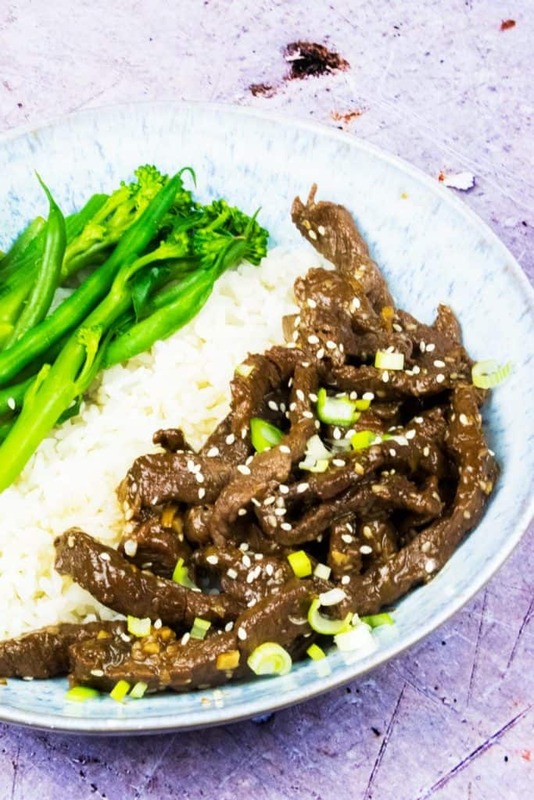 The syns that are in the recipe come from the honey and the sesame seeds, but even with these this delicious Fakeaway Healthy Teriyaki Beef works out at just 1 syn per portion! This absolutely won’t break the syn bank and is significantly less than if you were to order a Teriyaki Beef dish from the Chinese! 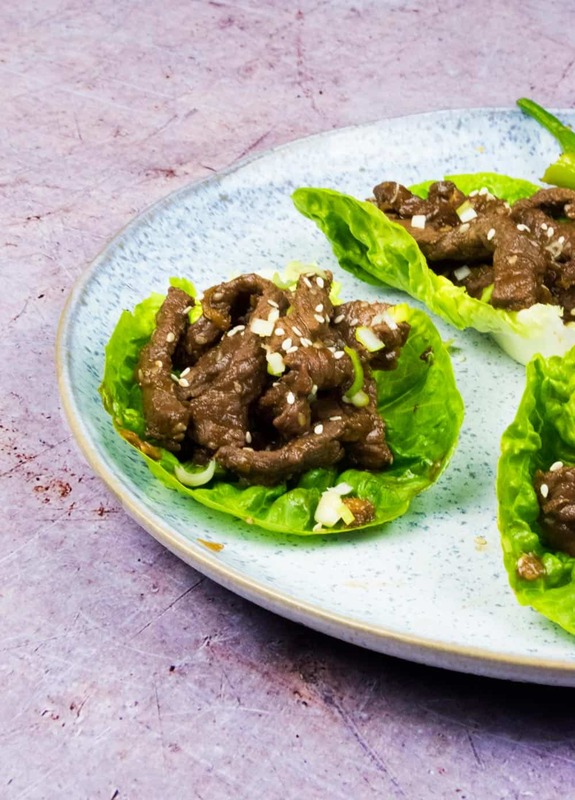 Moreover, if you are enjoying this Healthy Teriyaki Beef recipe on an Easy Extra SP day, you can make some tasty Teriyaki Beef Cups with gem lettuce instead of eating it with rice! This is exactly what I did when making this recipe for myself at home while making the rice for my boyfriend who doesn’t need to cut down on the carbs quite as much as I do. Even with the salad, instead of the rice, this was a super filling meal, particularly with my side of Chilli & Garlic Greens which were fried in low-calorie cooking spray and so stayed syn free! Whilst I’m a massive believer in the general principles of Slimming World, I’ve also become more aware recently of my more specific macro-nutrient breakdown on a daily basis. I’m trying my best to stick to Slimming World whilst keeping an eye on how many carbs I’m eating day to day (particularly good on SP) and making sure that I’m eating plenty of protein. I have therefore started including information on the more general nutritional breakdown of my recipes. If you are following Slimming World, please remember that you DO NOT need to worry about these if you don’t want to! 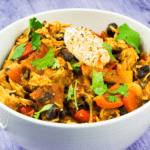 Having this information can help you build this recipe into your meal plans if you’re following the Keto diet, or counting your Macros for any other specific diet plan. 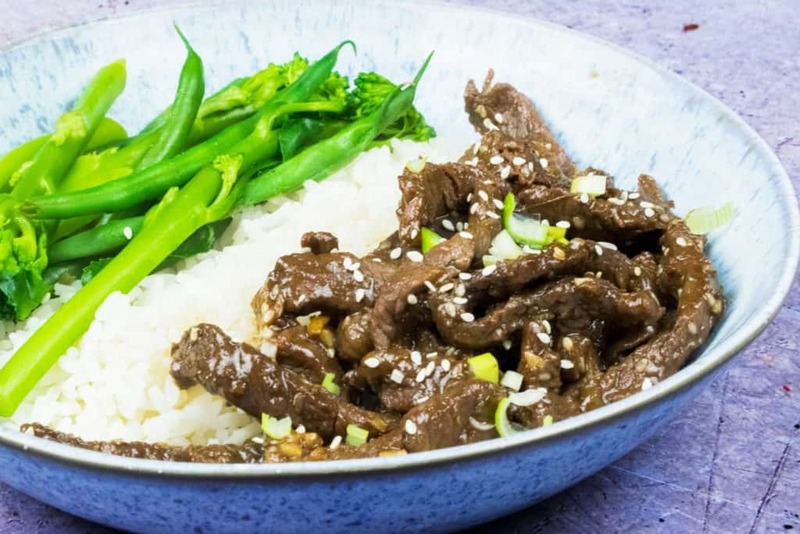 You’ll really enjoy this recipe for Healthy Teriyaki Beef whether you’re eating healthily or not. It’s packed with delicious flavours and the super silky sauce coating the beef woks perfectly whether you eat it with rice or salad. 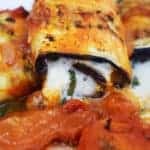 You could also easily make this recipe as part of your meal prep for the week, eating it hot or cold and it can be frozen if you want to make it in bulk! 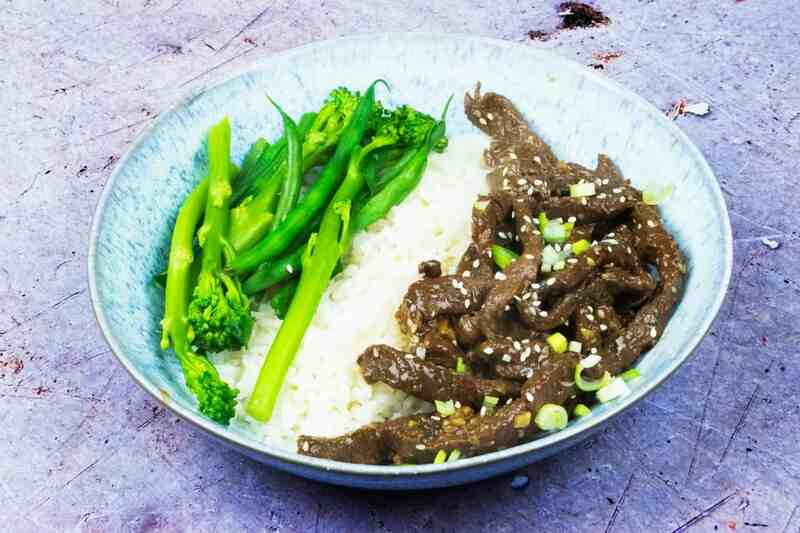 A tasty Healthy Teriyaki Beef recipe with loads of flavour! Just 1 syn per portion on Slimming World. Slice the steaks into thin strips. In a bowl add the steak, soy sauce, honey sesame seeds, garlic, ginger and spring onions, mix it all together until the steak is coated. Heat a frying pan over a high heat with low calorie cooking spray. Add the beef and make sure to get all of the sauce out of the bowl. Fry until the beef is browned, and then add the beef stock. Reduce heat and simmer until the liquid thickens and the beef is coated in a shiny sauce. 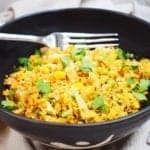 Serve over rice or in gem lettuce cups and garnish with sesame seeds and spring onions. 1 syn per portion on Slimming World. Makes 4 portions. Syn values correct at time of writing - please do not share screenshots of this recipe, share links instead! DON’T FORGET TO PIN THIS HEALTHY TERIYAKI BEEF RECIPE FOR LATER! Unbelievable 🙌🏼 Certainly a new fave!